The Los Angeles Convention Centre and its 760,000 square feet of space means there is a ridiculous variety of machinery at the LA Auto Show. Its brief goes beyond cars, and sometimes teeters towards sci-fi in its displays for personal transport of the future. Dedicated to customised vehicles and hot rods, Capitola's Californian coastline location means spectators can see the cars drive to their positions for the weekend. Its early June date also guarantees good weather; handy when there's a beach opposite. * And bigger still - the best classic events in the world! Already referred to as the 'ComicCon of cars', HooptieCon was created this year as a way of getting more spectators to 'lemons' race events. The Radwood element also sees owners of 1970s and '80s cars donning period dress. Held at Sonoma Raceway, the 200-strong line-up is truly odd, and having a race track at hand means some fairly unsuited cars will be tackling corners they have no right to. With the event having already gained much acclaim, the second edition of HooptieCon in 2019 should be even bigger. The world's longest-running indoor car show still pulls in huge crowds. 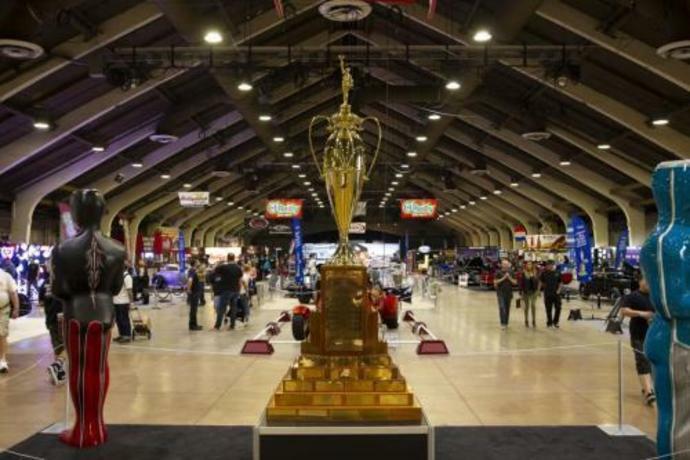 The 2018 edition of the Grand National Roadster Show attracted nearly 1000 custom roadsters, hot rods, muscle cars and historic vehicles - one of the largest line-ups in the show's 69-year history. A selection of those compete to be crowned America's Most Beautiful Roadster. This year's winner was a 1931 Ford Roadster. Situated on Fernandina Beach, this concours for vintage and collectible vehicles supports charities along Florida's First Coast. A 1929 Duesenberg J/SJ Convertible and 1963 Ferrari 250/275P won Best in Show this year, with Formula 1 and IndyCar champion Emerson Fittipaldi acting as honouree. Le Mans legend Jacky Ickx will take up the role next. The 87.5-acre Edsel and Eleanor Ford House estate hosts EyesOn Design's themed, invitation-only meeting. The theme changes annually, most recently to Design Inspiration and Influences. The judging panel is made up of retired designers from the automotive business. Other exhibits feature cars from the previous year's show circuit. This event is set in a big field and features a lot of cars - many of which are for sale. There is an emphasis on swapping for enthusiasts, and at 2018's show there was a lust for vehicles seen on film and television or in military service. Not all of the 1000s of cars are pristine - unsurprising when some of them have traversed the world's most dangerous terrain. There's no requirement for period dress, but Back to the '50s certainly takes St Paul, Minnesota back several decades every summer. The show has history itself, having started back in 1963. There are musical accompaniments, too, but it's dropped down the USA Today standings. A 30-mile stretch of highway is closed along the Mississippi Gulf Coast for 'America's largest block party', a week-long festival celebrating historic and hot rod vehicles, nostalgic music and more. Unusually it takes place in autumn, which means you can still catch this year's event on September 30-October 7.